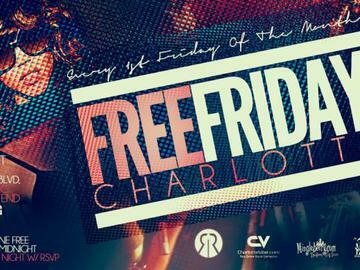 "FREE" "FIRST" "FRIDAY" are 3 of Charlotte's favorite words. Why, you ask? Because we like anything FREE, we like to be FIRST at everything & FRIDAY symbolizes the end of the work week and more importantly the beginning of the weekend! This Friday night May 4th join us at The Sunset Club as we bring back a QC favorite, experiencing true nostalgia while creating a new classic. At 9pm DJ C-Rob continues his monthly onslaught of the turntables while playing everything from songs like "Percolator" to "Get Money" to "I'm A Boss". Be prepared to stay on The Sunset Club dance floor all night! Its bill time and paying to party shouldn't be a priority. Save your money, use that for your family. Arrive Friday night prior to midnight and your entry is granted completely FREE! You have options, exercise them. Wanna party for FREE all night? RSVP here: http://bit.ly/IMrkXK and keep your dinero in your pocket. All night passes are limited so take advantage today! For those of you celebrating a special occasion or just wanting to elevate your Friday night Feng shui. Please consider our V.I.P. table packages. complete with bottle & hookah specials, it's truly the best way to celebrate. Reservations are easy, contact linda.sunsetclub@yahoo.com |7049749024 for yours. Let's connect! Follow on twitter @FreeFridayCLT & use the #hashtags #freefridayclt & #sunsetclub to let the QC know where to be this Friday night! The Sunset Club|1820 S. Blvd.